A photograph of Mrs Clinton. I like it. I've now felt fond of her from two cartoons which projected something of her spirit. So I add this picture to my repertoire. 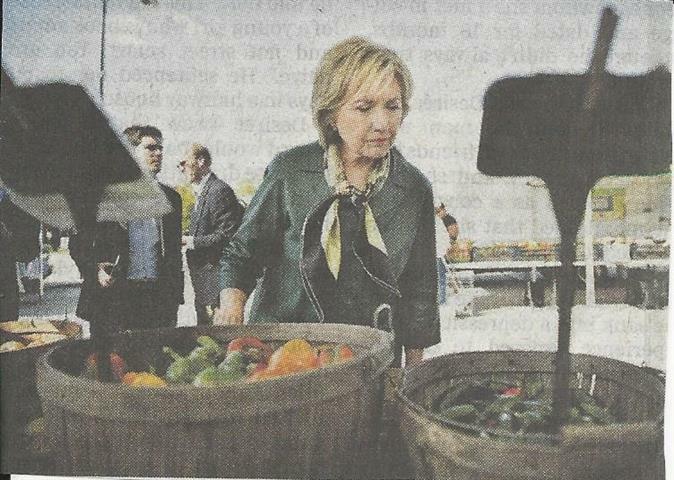 She is seriously examining the vegetables at a farmer's market. That's a genuine expression on her face. Imagining someone buying one to eat or cook. I am going to vote for her, and over the next few months, find stories telling about her policies and good aspects of her voting record (as well as bad ones -- her Hawkish military policy), and generallly speaking write blogs on her and our (those who vote for her and those who don't) behalf. She became a grandmother for the second time this weekend. Now my grandchildren all have four paws .... .
Catherine: "I like this photo too. Hillary Clinton doesn't "show" this face often. If you ever get a chance to meet her in person, you will see what I mean." Me: I gather the big circus atmospheres and public forums in general don't do her justice. Like many another woman, she's learned to keep a guard up -- or she'd have been destroyed long ago.